When you think of beautiful cities, Bucharest, the capital of Romania is likely not the first one to come to mind! And that’s why I love this city – it’s full of surprises! 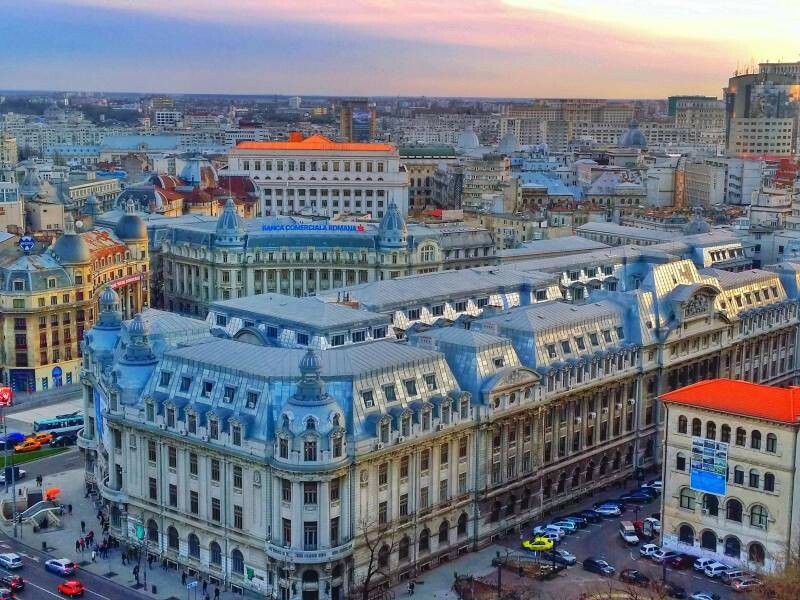 Bucharest is a contrast of beautiful historic architecture, along with bland functional buildings left over from its communist days and modern-day office buildings! Often all on the same block! You’ll notice while sightseeing in Bucharest that no two streets look the same! It reminds me of a patchwork quilt. I’ve previously taken you on a photo journey through Bucharest during the day, but I absolutely love sightseeing at night, that’s when it really comes alive. Or should I say lights up (pun intended)! Bucharest is famed for its nightlife, or so I keep hearing. Truth be told, I’m a party pooper who is usually in bed before midnight. But that didn’t keep me from exploring this ever-changing city in the evening – before midnight of course ;). Here are some of my favourite discoveries, along with some from other travel bloggers and a Romanian photographer. It’s sure to get your evening sightseeing off to a great start! Admittedly, I didn’t have to go far for my first view over Bucharest at sunset. I just walked out from my balcony at the Intercontinental Hotel Bucharest and was rewarded with an incredible view! The National Bank of Romania makes for an impressive site at night. It’s located in the Old Town. I passed the bank several times while searching for a restaurant in the evenings. The Romanian Academy is not the easiest building in the world to photograph, as it’s surrounded by a high gate. I was walking to a restaurant one night with a Romanian friend and snuck my camera through the iron gates to get this photo. He nervously waited for the alarm to be triggered. It didn’t fortunately, but I wish I could have gotten closer. The main goals of the academy are the cultivation of the Romanian language and Romanian literature. Photo courtesy of travel blogger, Fran Soler. Fran Soler from myguiadeviajes.com reports: It was getting dark and Cismigiu Park was so busy, with lots of people listening to a traditional music group. I think I was also here at the same time as Fran and loved Cismigiu Park as well. Being at the festival made me feel like a true Bucharester! Photo courtesy of photographer, Andrei Zdetovețchi. Andrei Zdetovețchi, of Andrei Zdetovețchi Photography a Romanian photographer, took this incredible photo of the Palace of the People from the Sky Tower. It’s the 2nd largest public building in the world. Only the Pentagon located in the U.S is larger! I’ve only seen it during the day, and am now kicking myself for not going back to see it lit up at night. 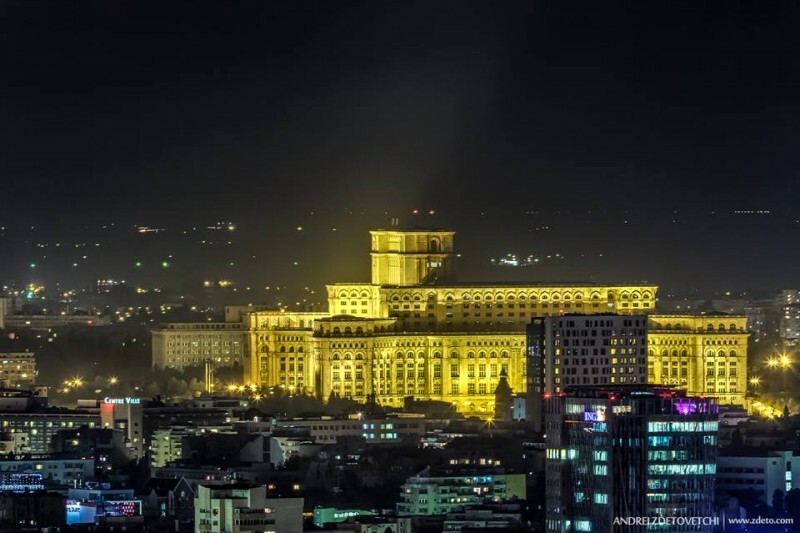 When I go back to Bucharest, this is at the top of my nighttime sightseeing list! Photo courtesy of travel blogger, Raphael Alexander Zoren. Raphael Alexander Zoren of Journey Wonders also enjoyed the Old Town: The night illumination of the Old Town area are truly a sight to behold, especially during the spring when the colours of the flowers start to bloom all around the river. Photo courtesy of travel blogger, Iñigo Pedrueza. Iñigo Pedrueza of La Rumania also checked out the festival in Cismigiu Park. It really is a happening spot, and it’s located in the city centre! And finally, our nighttime Bucharest sightseeing journey comes back full circle, to where it all started. Another gorgeous view over Bucharest from the Intercontinental Hotel Bucharest – which I enjoyed with a glass of wine! I may not be into the party scene, but I’m not a teetotaler either :). I visited Bucharest to speak at the Romanian Digital Travel Conference. I flew to Bucharest from Stuttgart, Germany with Blue Air and received transportation to and from the airport courtesy of CDI Transport. It was my second visit and I hope to visit again soon! This looks like a great city. It seems to be one that has fallen under the radar. @De'Jav - I think it falls under a lot of people's radar, but it's definitely worthy of a visit. Definitely not the image I had in mind and definitely worth a visit, Laurel! @Marcia - It surprised me as well - in a good way! I'd love to visit - especially after seeing the photos. I can't get over the size of the government building. What on earth happens in there? @Leigh - I know, it's huge! Besides tours, it's used by the Romanian Parliament and you rent event space there. Laurel, thanks for share my thoughts and my picture! Bucharest is a great and surprising city!! Best regards from south spain!! @Carlo, Both Budapest and Bucharest are great cities! The WiFi is great in Bucharest and you can find it in most restaurants and cafes. I'm not sure about the exact cost of living there, but I've heard it's very reasonable. The Palace of the People is such a massive building ... cool to see it lit up at night! @Hanaoi Food Tasting Tour - So glad to hear that you enjoyed your stay! I've been reading several articles about Bucharest o different travel blogs, just to see what tourists think of this city and yours is the fisrt one that captures the beauty of Bucharest by night. I saw someon asking about the cost of living here. It depends, it's mostly very affordable, but of course, there some more "fancy" places that charge more than they should for rooms or for food. That's why it's important to do your research beforehand, or to travel with a guide.